The next big thing in TV isn’t even a TV. An industry first, the JBL LINK BAR is a powerful soundbar that provides exceptional audio performance and delivers TV content in a smarter way with Android TV and the Google Assistant built-in. The LINK BAR is the most recent collaboration between JBL and Google, and expands the JBL LINK series. First showcased at the Google I/O conference in May 2018, the LINK BAR transforms any TV into a smarter TV, with legendary JBL sound performance. 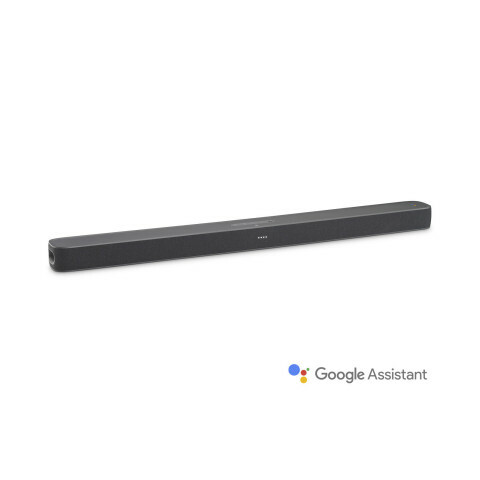 Equipped with the content of Android TV and the intelligence of the Google Assistant, this soundbar is anything but ordinary. Simply saying “Ok Google” grants instant access to streaming top Netflix flicks or YouTube videos, and content search becomes effortless through voice commands. Built-in Chromecast capabilities only heighten the experience, supporting both high-definition video content and sound to provide entertainment unlike any other. Once connected on the same Wi-Fi network as the LINK BAR, a smartphone, tablet or laptop can “cast” the latest chart-topping release or popular viral video from Chromecast-compatible apps. The LINK BAR features multiple HDMI inputs and a one-cable connection to a TV. Switching between devices is made simple with voice commands. For example, saying “Ok Google, switch to Blu-ray player” makes the shift occur. Additionally, the LINK BAR offers an optional subwoofer, which provides an even bigger and more resounding bass. Created with the tech-savvy, forward-thinking consumer in mind, the LINK BAR is one that adapts to everyone’s lifestyle. Google’s intelligence learns from each person who accesses LINK BAR, familiarizing itself with their voice and commands. One-piece soundbar with JBL legendary sound: Brings the best of JBL’s sound to any TV with rich bass performance. Android TV built-in: Delivers a smarter viewing experience, allowing users to find and watch programs more easily than ever. The Google Assistant built-in: Voice-activation lets users find a popular movie, check the score of the big game or dim the lights in a hands-free experience. PrivacySwitchTM for far-field microphones: Ensure the highest level of security and privacy and leave hackers out of the house. Multiple 4K video HDMI inputs: With 3 HDMI inputs and 1 HDMI ARC output, the LINK BAR becomes a 4K entertainment hub for video or gaming devices, with just one cable connection to any TV. Use voice-commands to switch between devices for seamless interactivity. Chromecast built-in: Instantly stream music, radio, or videos from a smartphone, tablet or laptop through the JBL LINK BAR. JBL LINK BAR ($399.95) and optional subwoofer ($299.95) will be available in Spring 2019. JBL creates the amazing sound that shapes life’s most epic moments. From iconic events like Woodstock and concerts at Madison Square Garden, to games at Yankee Stadium and weekend road trips, JBL elevates listeners’ experiences with award-winning audio that lets them make the most of every moment. With unmatched professional credentials and over 70 years of delivering industry leading innovation, JBL is the authority in engineering superior sound. HARMAN International (harman.com), a wholly-owned subsidiary of Samsung Electronics Co, LTD., designs and engineers connected products and solutions for automakers, consumers, and enterprises worldwide, including connected car systems, audio and visual products, enterprise automation solutions; and services supporting the Internet of Things. With leading brands including AKG®, Harman Kardon®, Infinity®, JBL®, Lexicon®, Mark Levinson® and Revel®, HARMAN is admired by audiophiles, musicians and the entertainment venues where they perform around the world. More than 25 million automobiles on the road today are equipped with HARMAN audio and connected car systems. Our software services power billions of mobile devices and systems that are connected, integrated and secure across all platforms, from work and home to car and mobile. HARMAN has a workforce of approximately 30,000 people across the Americas, Europe, and Asia. In 2017, HARMAN became a wholly-owned subsidiary of Samsung Electronics. © 2018 HARMAN International Industries, Incorporated. All rights reserved. Harman Kardon, Infinity, JBL, Lexicon and Mark Levinson are trademarks of HARMAN International Industries, Incorporated, registered in the United States and/or other countries. AKG is a trademark of AKG Acoustics GmbH, registered in the United States and/or other countries. Features, specifications, and appearance are subject to change without notice.